success you have treating your clients. and also receive a free copy of ‘A Specialist Guide to Sciatica and Back Pain Treatment’ as a bonus. When a therapist is confronted with someone in pain they need to look at the body in a particular way if they are going to successfully diagnose the problem and provide relief. ‘Using Massage to Effectively Fix Pain’ covers all these things as well as goes on to explain the importance of treating a body holistically. Most courses teach techniques for working on the part of the body feeling pain and not how the rest of the body plays an important role setting it up. The information in this book is different to what is taught in most other courses available and will provide an understanding of the body that you are unlikely to have been given before now. It is a totally free book with no obligation and is provided to introduce you to a unique and powerful form of bodywork called SLM. What any good Massage or Bodywork course MUST teach you to do. Why most therapists fail to get great results when treating chronic pain. The secret behind fixing all types of pain quickly and effectively. Things you need to consider when treating pain that you probably haven’t been taught yet. The approach only the best therapists know about and use to get superior results. Things you can do immediately, to have a positive impact in your treatments from tomorrow. Expert advice on Back Pain, Shoulder Pain and Knee Pain plus more. Great ways you can help your clients prevent pain occurring in the first place. The best ways to increase your skills and results in the quickest possibly time. This newly revised e-book, ‘Using Massage to Effectively Fix Pain’ contains previously unseen information you can use IMMEDIATELY to boost the success you are achieving with your clients. By filling in the form above you will be sent an email on where you can instantly download your free copy. 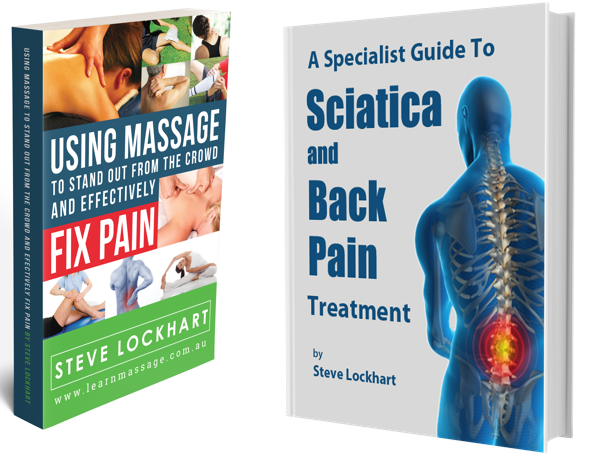 You will also get access to a free copy of ‘A Specialist Guide to Sciatica and Back Pain Treatment’ containing over 60 pages of facts and information that will help make you much more confident and knowledgeable when treating back pain and sciatica. Also other valuable tips and information to help make you a much more effective therapist will be emailed to you when you sign up for Steve’s FREE books in the space above. Use this free information to keep one step ahead of your competition or just keep up with them if they get hold of it. Are you thinking to learn massage, or perhaps wanting to update your massage skills? When considering massage courses, make sure the one you choose will deliver what it promises. It could easily mean the difference as to whether you become a therapist who can easily fix people’s pain or not. The underlying cause of most pain can be put down to a physical, emotional or chemical imbalance in the body, or a combination of two or all three. Any massage course teaching you how to fix pain needs to adequately cover these things and how they can best be dealt with by a therapist. This is one of the many things that should be standard content in any massage or bodywork course so it is vital for any potential student to know that this is exactly what they will get if they sign up. It is very important a massage course teaches students how to treat the whole body during a one hour session, because all parts of the body are connected and when there is a problem in one area it always has an effect on other areas. If a massage course focuses on treating the body as a sum of individual parts, the treatment will be disjointed and it is unlikely the pain will taken away quickly and effectively giving results that last. Most pain originates in the muscles which act like ropes and pulleys to determine the position of the skeleton. If the muscles are unbalanced and are pulling on one side of the body differently to the other side, the joints, discs and nerves become irritated and pain is the result. It is therefore important a massage course provides the student with the knowledge and techniques needed to effectively restore the muscle balance. Every person that lies on a massage table whether they are coming for a remedial, shiatsu, deep tissue, sports, relaxing or lymphatic massage, should reasonably expect that the massage therapist has been trained to do two important things. Not only should their massage course have taught them how to provide a great full body treatment, based on a sound diagnosis in each session, but they should also be able to accurately advise on the best diet, supplements and exercise for whatever body type they are treating. This holistic approach is the only way they will quickly and effectively take away pain and provide a sense of wellbeing with lasting results. A massage course that doesn’t train their students in these basics will leave them lacking in the important skills needed to do this. A massage course that focuses only on different ways to rub and stretch the muscles will only train the student to provide a band aid for problems rather than lasting pain relief. For this reason any massage course you consider should include subjects on what’s right and wrong in nutrition, the right and wrong exercises for rehab and why, when supplements are needed, general health, stress and all the things that influence it. It is no good being an expert at just massaging the body if you want to provide any further benefit than just a feel good session. From my experience most massage courses focus too much on rubbing and stretching the muscles, which leaves the student lacking in many of the skills needed to effectively treat pain. Although changing the condition of a muscle is an important part of providing pain relief, there are many lifestyle influences that determine the ease at which the muscles can be changed. A massage course needs to adequately address these to pass on the skills a student needs to fix pain. Hi Steve, Thank you for sending me this material. I am a retired osteopath. I am seventy five and had not intended to retire but did, and I am not now in a position to do any more courses. I only wish I had met you thirty years ago! Regarding your book: it would be of considerable interest to most people, both general public and prospective students. You obviously have a deep knowledge of the entire field and it is good that people like you are taking over from both orthodox medics as well as from some alternative therapists. I therefore wish you the very best of success in all that you are doing. By the way, I live in Asia.